Why Morocco with THE VACATION PROJECT? Our itinerary has been curated with our partners to give you access to exclusive experiences. Our NGO Partner High Atlas Foundation accepts volunteers, but if you were to go without TVP, the required time frame is much longer given the amount of logistics, effort, and coordination it takes to get volunteers on location. Through our exclusive partnership with the High Atlas Foundation, we have unlocked an incredible opportunity to not only experience the Atlas Mountains and the beautiful scenery, but also get to know the local communities that live there. The Atlas Mountains are home to the Berber people, who have lived in the Atlas Mountain range for thousands of years. In fact, they have been traced back to at least 3000 B.C. Because of this, tourists or locals rarely get to visit this part of Morocco. We have coordinated safe & comfortable transport from our other locations on the itinerary to make sure you get to experience this part of the world in all of it's awesomeness. On this trip, you will have an awesome local guide - Simo - who is our partner in Morocco. Simo is born & bred in Marrakech and is an expert on what to see and do in his home city. Some sneak peaks of what he has in store for TVP'ers are: a exclusive night out in Marrakech, a home cooked meal in our riad by his family, and an off the beaten path walking tour. Welcome to Morocco! You will arrive into Marrakech airport (RAK) and meet your local guide and driver at the airport. After settling into your riad you will enjoy a relaxing afternoon. During the evening, we will have a group dinner with the High Atlas Foundation for you to meet your fellow travelers and learn about the volunteer project that awaits you. You will enjoy a traditional Moroccan breakfast at the riad. Then we will be off on an early start to go to the village in the Atlas Mountains where we will complete our volunteer project: Tiziane. After the scenic drive through the mountains, when we arrive in the village you will meet you host families and get an overview of your volunteer project, as well as a tour of the village. We will then have a group dinner with our hosts and a celebratory music ceremony from the local musicians. Days 3 will be spent working on our volunteer project with the High Atlas Foundation. Budget from your trip has fully funded a new bathrooms for the local schoolchildren, where they currently only had access to one extremely rudimentary facility. You will continue the work on this bathroom, and meet the local schoolchildren. Outside of the volunteer time, we will also explore the mountains around us by going on a hike with our local hosts. You will spend another night with your host family. Day 4: Finish Volunteer Project, and Off to the Desert! Day 4 will be our last day on the volunteer project with the High Atlas Foundation. You will finish up the full day working on finishing the bathrooms, and saying good bye to our Tiziane hosts. At the end of the day, we will drive through the mountains to the Agafay Desert, where we will spend an amazing night camping in the desert outside of Marrakech. Plans include bonfires, music, and a group dinner outside. You will wake up at the desert camp and have a full day of desert activities. After breakfast in the desert, you will have the option to do activities like camel riding or 4x4 riding. You’re back in the big city, and we have a full day of touring. We will do a walking tour with our local guide, and explore the tangling alleyways and amazing markets of the Medina. You will have lunch at a rooftop restaurant with incredible views, and at night will discover the unique nightlife of Marrakech. Today we will explore Marrakech outside of the Medina. You will see sights like the Yves Saint Laurent Museum, the Jardin Majorelle, and the trendy neighborhood of Gueliz, which includes hip restaurants and art galleries. Discover the other side of Marrakech beyond the Medina, and you will be amazed at the history, and at the modern heartbeat of the city! Now that you have a handle on the Medina and outside of the Medina, you will have a free day to explore Marrakech and soak up the last of the city! Be sure to get all of those gifts, rugs, pillows, jewelry you were eyeing, or try that cool restaurant we didn’t get to. Just whatever you do, be back in time for our Goodbye Dinner. It’s going to be a party to remember, and a time to reflect on our time together and say bye to your newfound friends. Day 9: Goodbye Dream Team! The time has come to say goodbye :( We will wake up, have one last Moroccan breakfast at your riad, and then a driver will come to bring you to the airport for your trip home. THE VACATION PROJECT is proud to partner with the High Atlas Foundation, one of Morocco's largest and most highly regarded NGOs. The High Atlas Foundation (HAF) is a Moroccan association and a U.S. 501 (c) (3) nonprofit organization founded in 2000 by former Peace Corps Volunteers, and is dedicated to participatory grassroots human development in disadvantaged areas in Morocco, mostly rural. HAF received United Nations Special Consultative Status in 2011. HAF's team is comprised mostly of Moroccans with some international members. Using a participatory approach, HAF works to establish development projects in Morocco that local communities design and manage, and that are in partnership with government and non-government agencies. HAF is committed to facilitating, and training facilitators in, the participatory approach to local development, and helps to establish the priority projects that are designed in that process, including in fruit tree agriculture (building nurseries and irrigation systems, securing organic certification, and export of product), clean drinking water projects, women and youth initiatives, participatory and technical experiential training, and cultural preservation. HAF's work has touched over 45,000 individuals over the past 13 years. HAF's work continues to grow, as it currently has active projects in eight provinces of Morocco. HAF's development vision is Morocco's vision for itself: it is public-private collaboration at all levels of society in order to assist communities (villages and neighborhoods) in furthering their self-reliant development. It sees members of local communities across the kingdom coming together to identify and implement the projects they most need and want a which range depending on the opportunities they face. Sign up below if you would like to join the waitlist for next trip or if you would like to talk to us about planning a custom trip for your friends or family! 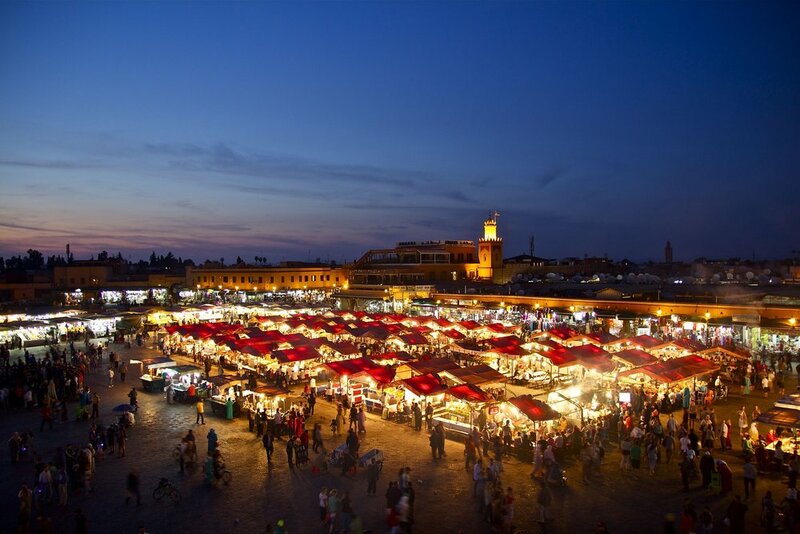 I travelled to Morocco with The Vacation Project group over New Years. It was fun! I made lots of amazing new friends! I feel connected to the people of Morocco! I saw, smelled, tasted, felt, and experienced things never before sensed. Vacations can be weird for me because I’m mostly a selfless person... but just being able to help the people of the Berber village while staying with them and becoming a part of their family... and then having them guide us on hikes and explorations.... what can I say, it was perfect! All of the amazing people of TVP are very special to me now, and I see myself staying connected with them for a very long time! Brie & Hannah are some of our favorite bloggers from The Dumb Blonde Travels - an amazing blog that provides super savvy advice for the less than savvy explorer. They recently traveled to Marrakech and compiled their top tips for first time visitors to this amazing city. You can check out their site and this original blog post here! We're so excited to have you on board for our Morocco trip!! The biggest question we get from our travelers is... how the heck do we pack for this trip?